Great session last night with local binders and book artists and printmaker Lee Bratt. Lee generously shared her work and working methods with us, including the use of a pasta machine as a printing press. Over the years, I've dabbled in various forms of print making (monoprint, linocut, etching, dry point, screen printing) but never with enough commitment or diligence to develop the sort of skills I envy in others. Lee's enthusiasm might just be enough to set me trying again. Pieces: A Graffiti Alphabet is a series of 26 solvent release images of graffiti letters that I made some time ago and bound in the French simplified style. Releasing the images with artist's turpentine was not a pleasant experience and I was interested to learn from Lee that eucalyptus oil works just as well. 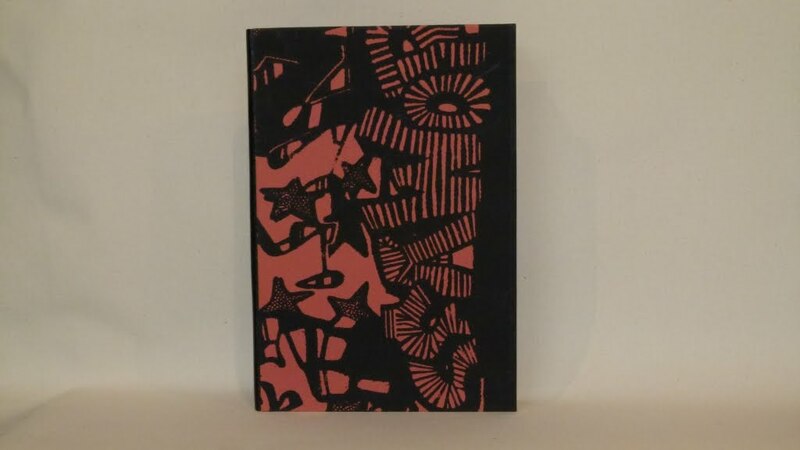 The cover is a lino cut image printed using the standing press in my bindery. The work was first shown in one of Australian Bookbinders' Inc's early exhibitions at Messrs Berkelouw's Leichhardt Bookshop. It's subsequently been shown in a 2008 retrospective exhibition at Sydney's Delmar Gallery and in the Canberra Craft Bookbinders' Guild's 2012 Showcase exhibition. The method has its limitations and is only realy suitable for printing with flexible plates. Print width is obviously limited to the pasta machine roller width. Lee assembled a 'sandwich' with the inked 'plate' in the centre; a sheet of printing stock folded in half and wrapped around the plate; and a piece of light/medium weight boxboard front and back. The width between the rollers was then adjusted to the minimum distance that would allow the assembly to be fed through the machine. The roller pressure was enough to get a reasonable transfer of ink from the plate to the stock. Lee's pasta machine was a cheap one with not a lot of roller adjustment so it wasn't possible to print a standard thickness linocut. 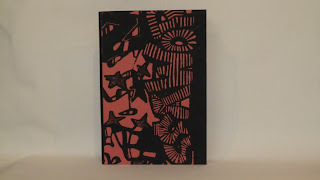 She used a plate of waxed paper cut from a milk carton but felt it should be possible to source thinner lino for printing traditional linocuts. Alternatively, she suggested using a more expensive pasta machine.